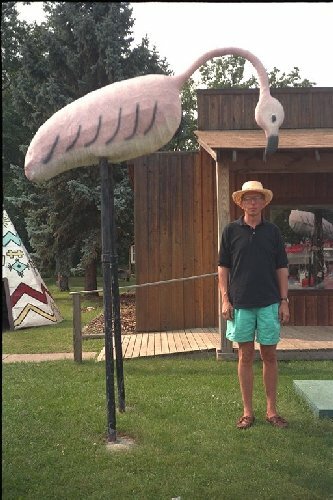 Houghton Lake Flamingo – The Home of My "Big Things"
Virtually across the street from Zubler’s Indian Village on M-55 in Houghton Lake, MI. (See the Big People page.) I didn’t realize at the time how cool these double hits were. At any rate this flamingo is one of my all time favorites, it illustrates the absurd part of this hobby. If you still don’t get it, study this image until you do.